For organizations, teams, families and communities. This versatile tool is useful for planning events and projects in 2 hours. Includes: video guidance, team planning templates and a coordination calendar. Accelerated Action Planning Package — This video guides you and your team through a step by step process for planning and setting into action your project plan. You will receive many of the same benefits of having Heidi, a professional facilitator, work with your team personally. Save time and resources and download this insightful and empowering instructional video today. The total run time for the video is 23 minutes. You will also want to download the .PDF templates that are included in this package and have them enlarged for use in your meeting. You will also receive a calendar template to document your team’s project plan. If you find these tools to be valuable for your meetings, please make a donation! The suggested price was formerly $39.00, but we encourage you to pay what you’d like. We want to get these helpful tools out to as many people as possible. We want to help your team accomplish great things together. We just can’t stand watching teams struggle – with people burning time going to meeting after meeting with endless discussion, little action and painful experiences to boot. There is no reason for this. We can help. We know that with our process, your team can be highly successful at accomplishing your goals and have fun in the process. Therefore, we have dedicated ourselves to helping teams work together not only effectively but also efficiently. 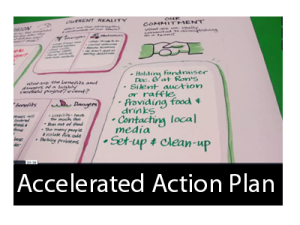 The Accelerated Action Planning tool to provides a fun, fast, and easily accessible way for you to facilitate your own teamwork. As a professional facilitator, I saw the need for ad hoc and work teams to use the same time-saving tools that we use. I developed self-guiding templates and instructional videos to help you have productive teamwork wherever you are.